Posh goalkeeper Ben Alnwick and centre-back Christian Burgess can't stop Bristol City taking the lead. Photo: Joe Dent/theposh.com. There is of course no disgrace in losing away from home to the best side in League One. But it’s still rather deflating to receive such convincing confirmation that Peterborough United are, this season at least, no longer serious promotion contenders at this level. They are a hard-working mid-table team at best. They tried hard at Ashton Gate, but even a City side playing at half speed won at a canter. A goal early in each half proving decisive and not at all flattering against a Posh side who failed to muster an effort on target until the 84th minute or to create an opportunity all night from numerous set-pieces. 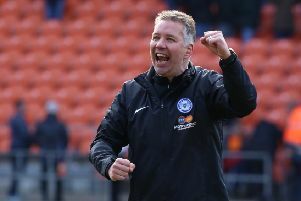 Posh pride will ensure disappointment at defeat and at the fact that some of the passing was appalling, but the truth is the players are not currently at the club who can test the best sides in League One. Manager Darren Ferguson handed experienced midfielder David Norris a full debut in place of the the more creative qualities of Erhun Oztumer, presumably in an attempt to stifle the energy and skiill of the home midfield. Less understandable was Aaron Mclean’s presence up front alongside Luke James. Ferguson spoke about matching City’s energy before the game so Jon Taylor was surely the more obvious candidate. Anyway the best laid plans were dashed after just nine minutes when poor marking at a corner enabled Aden Flint to tap City ahead after Posh goalkeeper Ben Alwick had saved a header at goal from Matt Smith. It was an ominous start by the League One leaders, but the game went flat very quickly after the goal. City controlled the game completely, helped by some awful Posh passing, but rarely tested Alwnick after he’d tipped over Luke Freeman’s 20-yard shot to concede the corner that led to the opening goal. Posh forced enougth set-pieces, usually through the hard, direct running of Luke James, but City won all the key headers. Norris did volley a half-cleared Joe Newell long throw just wide from 20 yards, but the only other Posh shot of note of the first-half was taken on by Christian Burgess from fully 40 yards out with predictable results. And any hope of a comeback was shattered three minutes after the re-start despite some brilliance from Alnwick. The Posh number one made a superb save to divert Joe Bryan’s ferocious shot onto the crossbar, but the ball was quickly returned by Bryan for Kieran Agard to stoop and head the ball over the line. Posh, too late some would say, switched formation and personnel for the final 30 minutes, but little changed. Oztumer was introduced at the tip of a midfield diamond and Taylor finally replaced Mclean, but despite plenty of huffing and puffing Posh rarely looked like scoring. Christian Burgess and Michael Bostwick performed well at the heart of the defence and Jack Payne put in a decent shift in front of them, but Posh offered no attacking threat at all. Posh (with marks out of 10): Ben Alnwick 7, Shaun Brisley 6 (sub Erhun Oztumer, 60 mins), Michael Bostwick 7, Christian Burgess 7, Michael Smith 6, Jack Payne 7, Harry Beautyman 5, Joe Newell 5 (sub Kgosi Ntlhe, 66 mins), David Norris 5, Luke James 5, Aaron Mclean 4 (sub Jon Taylor, 60 mins). Unused substitutes: Dion-Curtis Henry, Gaby Zakuani, Harry Anderson, Conor Washington. Bristol City: Frank Fielding, Mark Little, Aden Flint, Luke Ayling, Derrick Williams, Joe Bryan, Korey Smith, Marlon Pack, Luke Freeman (sub Wade Elliott, 89 mins), Matt Smith (sub Aaron Wilbraham, 75 mins), Kieran Agard (sub Jay Emmanuel-Thomas, 88 mins). Unused substitutes: Dave Richards, Scott Wagstaff, Greg Cunningham, James Tavernier. Goals: City - Flint (9 mins), Agard (48 mins). Cautions: Posh - Smith (foul).